This robust model has the premium of being manufactured in the finest of materials. 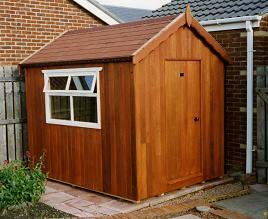 Walls are 14mm Cedarwood with an attractive heavy duty felt slate roof (in green, red or grey). The single in-opening door is complete with rim lock and keys. centrally positioned in one gable end. Top opening 1200mm x 750mm high (4ft x 2ft 6in) window along one side. This superior design also has be added benefit of being higher than our standard design. Please contact our office on 01833 650274 for further information.